French Fries have sure gotten a bad rap in the last few decades.. 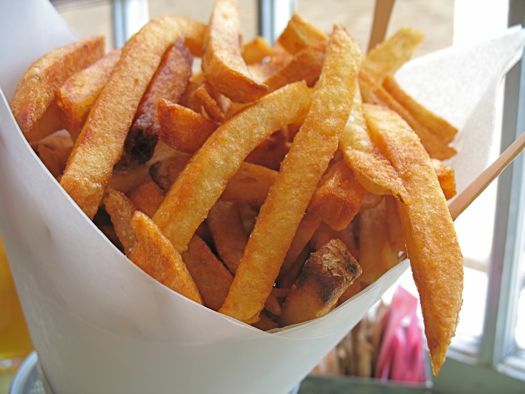 BUT, what make French Fries unhealthy is when they are fried in vegetable oil. Yes, all those vegetarians who insisted that McDonald’s stop using beef fat were WRONG! Their fries are now soggy, no longer crisp. And heating vegetable oils is dangerous as the oils are then oxidized, making them highly carcinogenic. BUT, it is crucial for you to use organic beef fat so that it is healthy. Never use or eat feed lot meat or fat…it is too toxic. Beef fat gives us that nice crispiness that is the reason we love them! 1. Heat fat in a 6-qt. Dutch oven over medium-high heat until the fat starts to bubble and is just shy of smoking. Working in small batches, add potatoes and cook, turning occasionally until pale and tender, 10 to 12 minutes. Fries should be nice and browned. 2) Using a slotted spoon, transfer fries to a wire rack set over a baking sheet to drain.